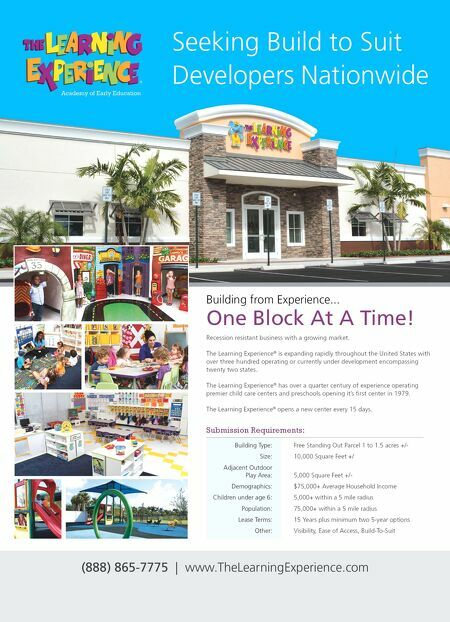 DEVELOPMENT 234 • SHOPPING CENTER BUSINESS • May 2018 T he world of retail development is encountering tremendous head- winds of change. It's no longer just about creating great shopping desti- nations — it's about understanding how to create places in the hearts of consumers — places people choose for emotional rea- sons, where the elements of place match the elements of their lives and values. To- day's retail environment is tough. Internet is challenging brick and mortar, retailers are closing stores and carefully choosing locations for new stores — looking for that very extraordinary environment that will attract new and repeat customers and gen- erate buzz and high sales. Developers often can see, taste and feel the right vision, but they struggle to make it a reality. The vision often becomes com- promised by three common mistakes: looking at short term results rather than long term revenue growth; budgeting fo- cused on reaching the lowest cost rather than the highest customer experience; and relying on in-house staff or vendors that do not have the knowledge or expe- rience to realize the vision and the brand in this new world. 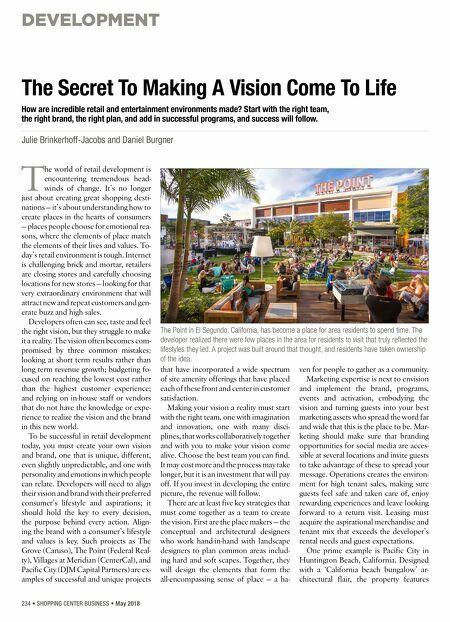 To be successful in retail development today, you must create your own vision and brand, one that is unique, different, even slightly unpredictable, and one with personality and emotions in which people can relate. Developers will need to align their vision and brand with their preferred consumer's lifestyle and aspirations; it should hold the key to every decision, the purpose behind every action. Align- ing the brand with a consumer's lifestyle and values is key. Such projects as The Grove (Caruso), The Point (Federal Real- ty), Villages at Meridian (CenterCal), and Pacific City (DJM Capital Partners) are ex- amples of successful and unique projects that have incorporated a wide spectrum of site amenity offerings that have placed each of these front and center in customer satisfaction. Making your vision a reality must start with the right team, one with imagination and innovation, one with many disci- plines, that works collaboratively together and with you to make your vision come alive. Choose the best team you can find. It may cost more and the process may take longer, but it is an investment that will pay off. If you invest in developing the entire picture, the revenue will follow. There are at least five key strategies that must come together as a team to create the vision. First are the place makers — the conceptual and architectural designers who work hand-in-hand with landscape designers to plan common areas includ- ing hard and soft scapes. Together, they will design the elements that form the all-encompassing sense of place — a ha- ven for people to gather as a community. Marketing expertise is next to envision and implement the brand, programs, events and activation, embodying the vision and turning guests into your best marketing assets who spread the word far and wide that this is the place to be. Mar- keting should make sure that branding opportunities for social media are acces- sible at several locations and invite guests to take advantage of these to spread your message. Operations creates the environ- ment for high tenant sales, making sure guests feel safe and taken care of, enjoy rewarding experiences and leave looking forward to a return visit. Leasing must acquire the aspirational merchandise and tenant mix that exceeds the developer's rental needs and guest expectations. One prime example is Pacific City in Huntington Beach, California. Designed with a 'California beach bungalow' ar- chitectural flair, the property features The Secret To Making A Vision Come To Life How are incredible retail and entertainment environments made? Start with the right team, the right brand, the right plan, and add in successful programs, and success will follow. Julie Brinkerhoff-Jacobs and Daniel Burgner The Point in El Segundo, California, has become a place for area residents to spend time. The developer realized there were few places in the area for residents to visit that truly reflected the lifestyles they led. A project was built around that thought, and residents have taken ownership of the idea.